Wedding preparations are a great source of pleasure for many brides. However, with the huge scope and seemingly endless range of options for every aspect, the task of wedding planning can seem overwhelming. 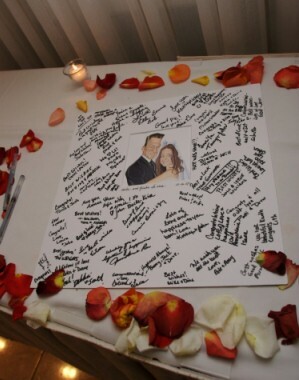 One way of simplifying the process can be through the dual or even triple use of one element of your wedding needs. Think about date claimers, invitations, sign in board, place markers, wine labels and bridesmaid/groomsmen gifts. Often the task of looking through endless albums of card styles, colors, prints and fonts can become overwhelming. 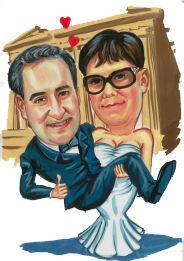 A novel and fun way around this onerous task can be through the use of a custom drawn caricature. Now before you think of traditional caricatures as being big noses, teeth lips etc, also think of caricatures as having some slight parody effect, while remaining quite true to the individual. Of course if you prefer more exaggeration….! 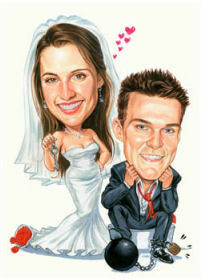 A custom created caricature can provide a wonderful method of portraying the bridal couple in whatever way you wish. Take for instance the Date Claimer. The comedy effect can be gained from the approach of the girl getting her guy. The wedding invitation can reflect the location of the wedding, the couple in their wedding attire and can be used to set the tone for the wedding. It can be very formal, with a nicely posed couple, or can have a hint of cheekiness or dual announcement, perhaps the groom carrying the bride (or the other way around!) or the groom with a ball and chain around his leg or in some what under the bride’s control! Wording can also be included as part of the image. Or have one version with wording and one version without and the second version can be part of the multi-use that the caricature can play. While many couples have a book where people can place their well-wishes, increasing numbers are now opting not to have an sign-in item that will live it life in a drawer, but instead to have signatures placed on a beautiful item that can then have a place in the home as a decorative item. 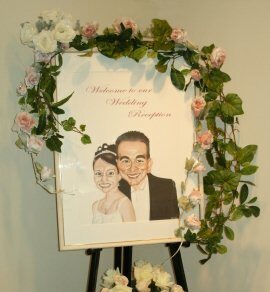 The sign-in caricature can be the same image used for the invitations – printed at a large size and perhaps placed in a frame with a wide white mat. After the wedding the protective cover can be fitted to the image and then there is a wonderful artwork to hang in the home. Often bridesmaids will suggest this to the bride and help take care of its production. 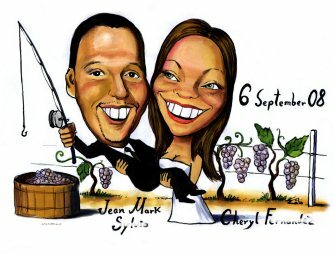 The caricature can also be used on table seating cards and also through specialist printers, as a very unique and wonderful wine label. Some artists will also create a plain line version of the art and this can be printed on the neoprene ‘stubby coolers’ that are popular at Australian weddings or ‘can coolers’ for UK or ‘can coolies’ in the USA. Finally there are the bridesmaids and groomsmen gifts. 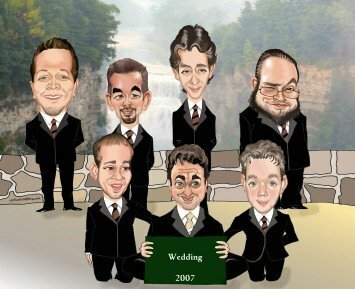 These can be custom drawn caricatures of each group, or maybe reuse the wedding couple caricature with new wording! As you can see, a single custom drawn piece of caricature art can have several uses and be created to suit your exact needs.